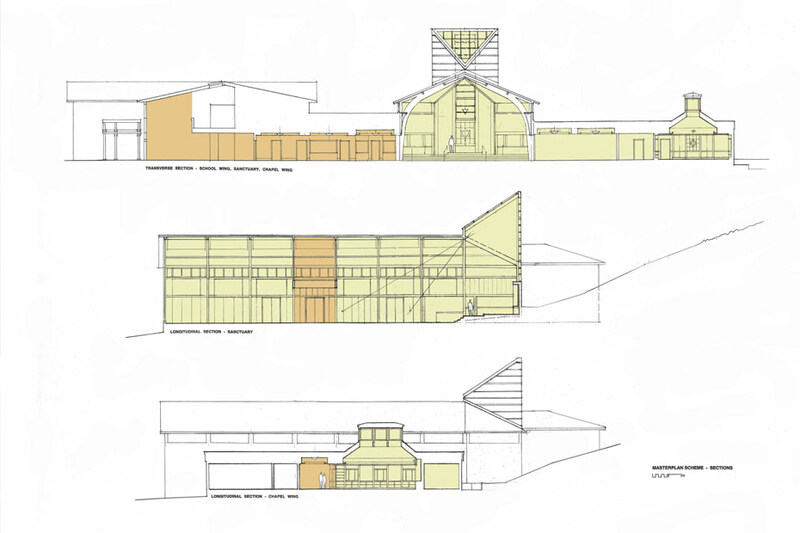 A new bay with light tower presents the relocated ark and eternal light and transforms the space. 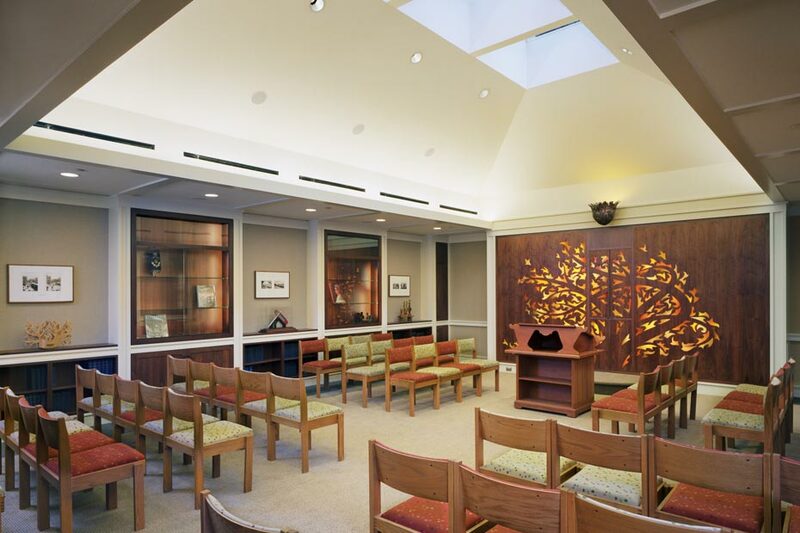 New clerestory glass and light shelves bring in more natural light, diffusing it toward the ceiling without glare. 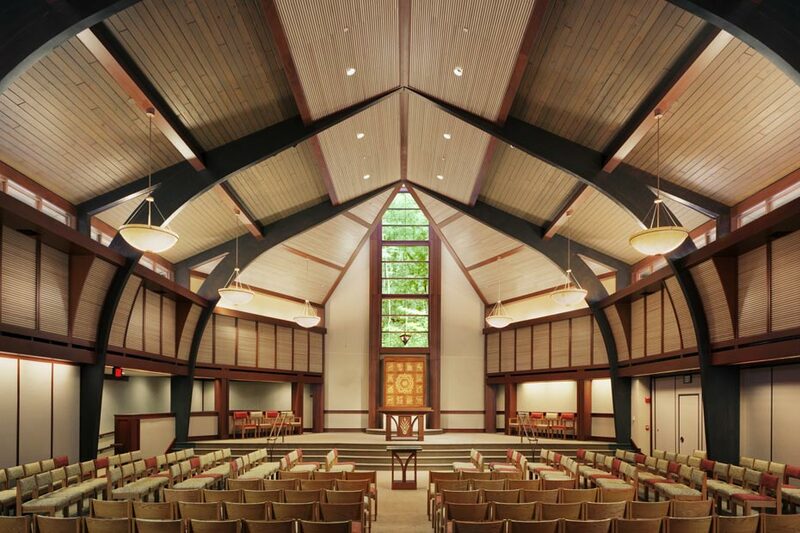 In the chapel indirect fluorescent coves and compact fluorescent wallwash downlights efficiently wash the ceiling coffer and walls to make the room feel bright and provide ambient light. Adjustable halogen downlights accent the celebrants. 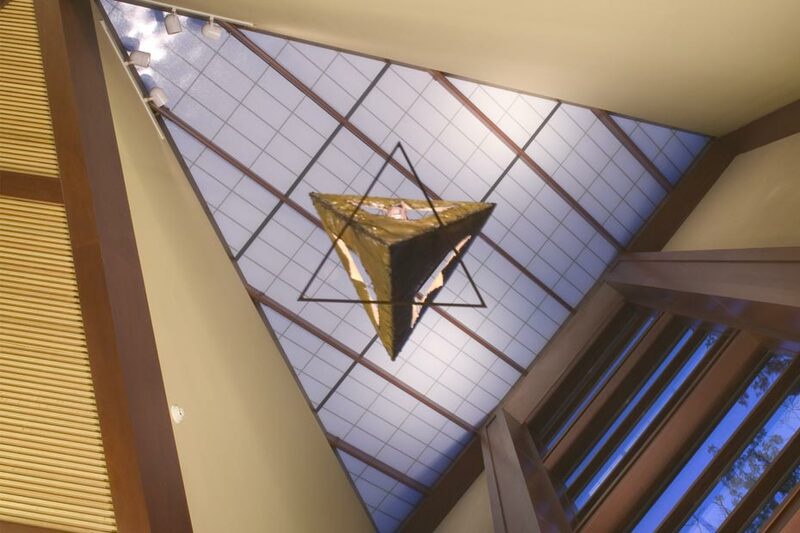 The translucent skylight brings diffuse illumination to the bima (stage) while the clear anti-reflective glass of the “Jacob’s Ladder” allows views of the landscape and heavens. Miniature T2 fluorescent strips behind the casework jambs illuminate the displays. Restored stained glass panels at the ark are backlit with new fluorescent fixtures and diffusing media. Fluorescent semi-indirect pendants, indirect coves on light shelves, and linear wall washers illuminate the new and revitalized surfaces to give ambient illumination, complement the daylight and enhance the feeling of lightness. Faux alabaster diffusers on the pendants and 3000°K phosphors in all fluorescent lamps bring out the natural warm colors of the woodwork. Adjustable halogen PAR downlights illuminate the seating for reading and adapt to the sloped ceilings. Track fixtures are tucked in front of existing arches and in the tower. At the chapel a new monitor having clerestory windows illuminates with diffuse daylight, blocking direct sun that might cause glare. 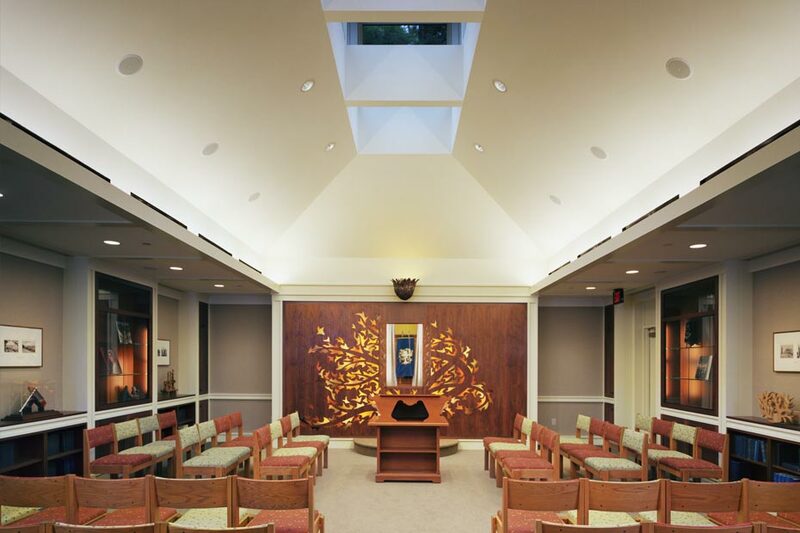 The symbolism of light infuses the refurbished and enlarged main sanctuary and chapel of Temple Isaiah. 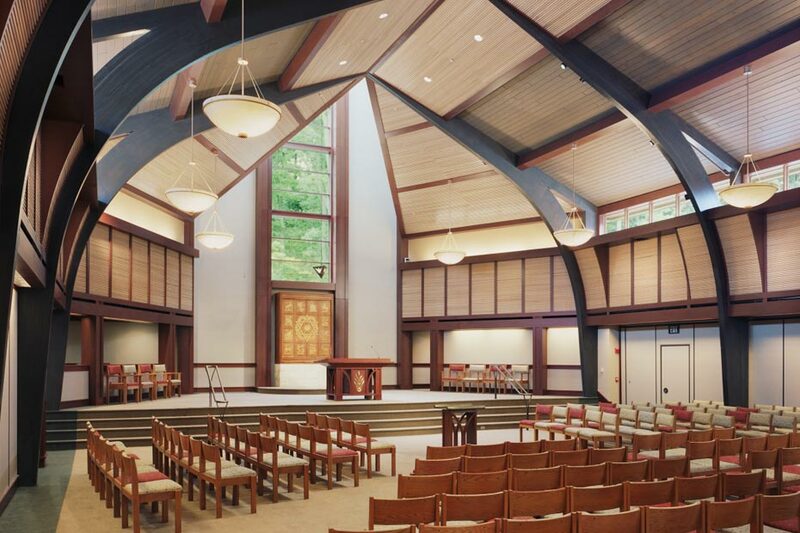 A new light tower and improved clerestory glazing with shielding in the sanctuary, and a monitor in the chapel illuminate the worship spaces and strengthen the connection to the divine. New fixtures supplement the natural lighting, provide illumination for reading, accent the celebrants and highlight displays.